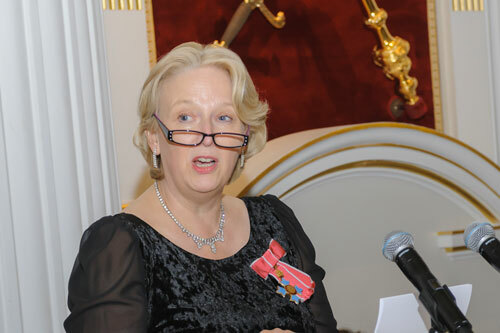 Dame Jayne-Anne Gadhia DBE delivered the City, University of London Rector's Dinner speech on Monday 1st April at Mansion House - the official residence of the Lord Mayor of London and the Rector of the University, Alderman Peter Estlin. The Dinner provided an opportunity for the University to share its news and achievements with its supporters and develop relationships with new individuals and organisations. An edited extract of her speech is below. "Rector, Chair of Council, President, My Lord, Sheriffs, Ladies and Gentlemen. "Last week a young woman came to see me to ask for some career advice. She was bright, ambitious, successful as a McKinsey consultant and keen to make a plan for the years ahead. "I asked her what she wanted to achieve with her life. “'I want to be you,' she said. Which surprised me somewhat as I have not seen being middle aged, overweight and unemployed as something to aspire to previously. "I asked her what she really meant and she said that her dream is to run a big business. When I asked her why, she was not sure. Her aspiration was clear. But her purpose was not. "She reminded me a bit of my best friend, Sarah. Sarah is a brilliant mathematician and was one of the first woman to qualify as an actuary too many years ago for me to remember. "But being an actuary was such a huge thing for Sarah that it has defined who she is - and she is so, so much more than that qualification. "But, that said, it is true that, in the City, what we do defines us. Having spent many years introducing myself as ‘Jayne Anne Gadhia - CEO of Virgin Money’ it is difficult to know what to say now that I have stepped down from that role. Is just ‘Jayne Anne’ enough? "Is it enough to be defined not by what we do but by who we are? "That question was put to me more than 25 years ago when I was studying for an MBA at City University Business School. I had a brilliant, eccentric and maverick professor - Ronnie Lessem - who undoubtedly inspired me to be myself and to change the world. "After all this time I have largely forgotten the textbooks we studied but I have never forgotten his two main lessons. "First, Ronnie challenged us all to bring our real and whole selves to work. How simple but how profound. Especially for someone like me who was trying to fit into the world of work - which was definitely ‘a man’s world’ at the time. "I was trying to work out the way in which things were done in the accountancy profession and in a big corporate at the time. But being urged to just be myself took a huge weight off my shoulders. And I have tried to do that ever since. Every day. "But Ronnie also urged us to define our purpose. To consider profoundly how we could use the world of work, the business of business if you like, to make a real and fundamental difference to the world. "It is a message that continues to drive me today. "Last October, the Virgin Money Business was sold to the Clydesdale Bank. In a big corporate transaction, Directors have a fiduciary duty to maximise shareholder returns, but I was also focused on how we could make the deal work for all our stakeholders - customers, colleagues and communities as well as our shareholders. "Because Virgin Money had done some work helping Church of England Primary Schools to teach children the benefits of saving money, I knew the Archbishop of Canterbury Justin Welby a little bit. So, I wrote to him to ask how I might think about my deal in the context of all my stakeholders. "He wrote back: 'many people think that the business of business is business - but you and I know that the business of business is human flourishing and in your deal you should work out how to achieve that'. "Goldman Sachs were our bankers and, when I presented these thoughts to my Board, they pointed out that they had never had to consider the thoughts of the Archbishop of Canterbury in any deal before! "In fact, the very first time I spoke with Justin, I called him on his mobile. When he answered, I said 'gosh, it seems a bit odd to be speaking the Archbishop of Canterbury on a mobile phone'. "It was then that I understood the importance of our historic institutions. The structure and stability that they bring to our lives - as long as they are sufficiently flexible to remain relevant in today’s world and as long as those who hold office define the established role by being themselves. "Nowhere is this truer than in the office of the Lord Mayor. "Peter, I understand you are the 691st Lord Mayor of London. The office holds good. "But how astonished would your predecessors be to find that, in the last couple of weeks, you were tweeting about your experiences on your official trip to China. "And how inspired would they be to know that you, like each of them I am sure, are stamping your own personality on the office of Mayor, by focusing your year in office on building tomorrow’s City today. "So, what will tomorrow’s City look like? And how powerful will it be in what is shaping up to be a new world economy? "I think success will depend on the City’s ability to reach out not only to the rest of the world - but to the rest of the United Kingdom. "And, for me, that means creating a City that is more accessible to people of every gender, creed, ethnicity and social background. A City that represents our nation. A nation that represents the world. "Our institutions must broaden their appeal to a much wider variety of people. "Our businesses must create talent pipelines from the wisest possible recruitment pools. "And our educational establishments must help generations of students to realise that not only is it all right to be themselves but that it is essential if we are to build our country to compete ever more effectively on tomorrow’s world stage. "When the young woman who came to see me last week comes back, I hope she will not say 'I want to be like you' - she will say: 'I am happy to be me and I am going to change the world'. "So please raise your glasses to confidence, purpose and self-belief in the City of tomorrow." Jayne-Anne Gadhia was Chief Executive of Virgin Money from 2007 – 2018 and is a member of the Cass Global Advisory Board, which helps to shape, elevate and fuel collective ambitions for Cass as a leading global business school. In November 2016, Jayne-Anne was appointed as the UK Government’s Women in Finance Champion and in July 2017 she became a founder member of its Business Diversity and Inclusion Group. Jayne-Anne was made a Dame in the Queen’s New Year Honours 2019, for her contribution to financial services and women in the finance industry.